The youngest pupils at The Grammar School at Leeds (GSAL) have marked the school’s 10th birthday by creating a beautiful and lasting memorial to a former pupil. Taking daffodils as their theme – flowers often associated with 10th anniversary celebrations – the children at Rose Court nursery and pre-prep created a mosaic birdbath. This will have a permanent home in a daffodil garden which was planted in the grounds of the school in 1994 in memory of Catherine Apps, who was a Year 8 pupil at Leeds Girls’ High School. In the autumn term following her death, her friends all planted daffodil bulbs, which still bloom every spring at Rose Court. Catherine’s mother, June Apps, who taught chemistry at Leeds Girls’ High School from 1992 to 2007, visited Rose Court to meet some of the children and to see the birdbath, in which each pupil had placed a piece of mosaic. 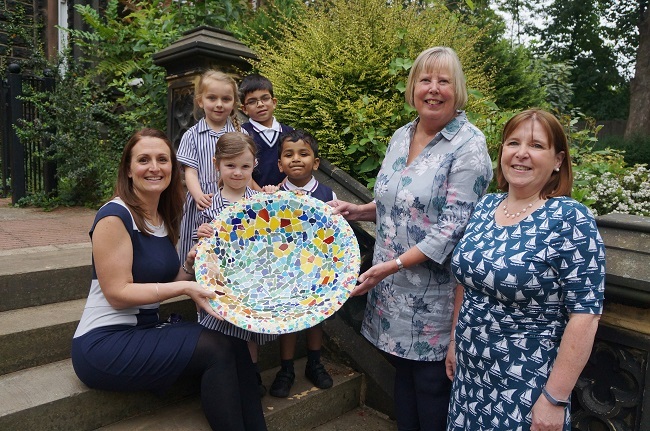 The birdbath project was led by teaching assistants Bev Nicholaides and Bernadette Butler, who wanted the children to work together to create something beautiful to commemorate 10 years of GSAL.